Introduction: Deep bite correction in patients with convex profile and increased maxillary incisor visibility, and normal or increased vertical dimension necessitates the intrusion of maxillary incisors. Intrusion arches or miniscrews are commonly used for this purpose. 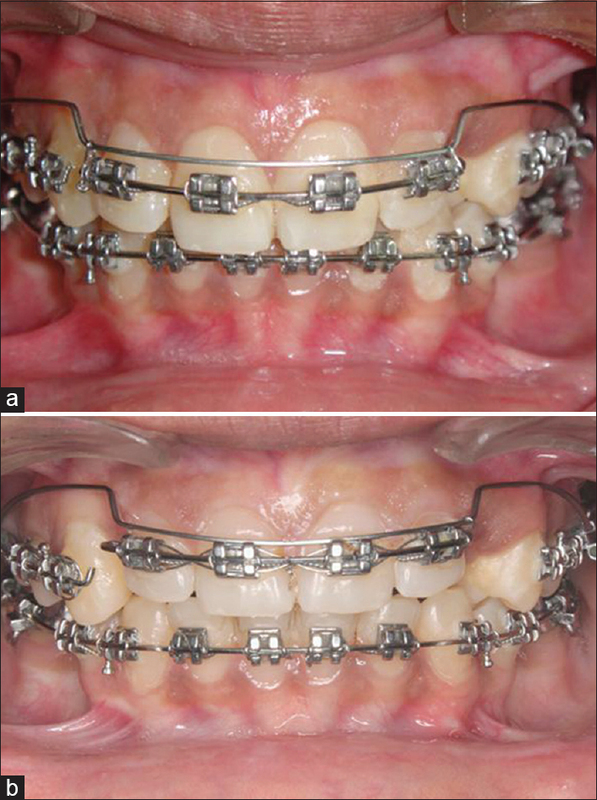 The current study compares one of the prefabricated intrusion arches, the Connecticut intrusion arch (CIA), and the temporary anchorage devices (TADs) in their effectiveness for orthodontic intrusion. Materials and Methods: The present prospective study was done on 24 patients in the age group of 15–25 years undergoing fixed orthodontic treatment. In Group I, TADs were placed for intrusion while, in Group II, CIA was placed. Anchorage was reinforced in Group II using transpalatal arch. A paired t-test or a Wilcoxon signed-rank test was performed for the assessment of treatment changes within the groups, and an independent t-test or a Mann–Whitney U-test evaluated change between the groups. Results: Both TADs and CIA can bring about significant amount of true incisor intrusion with resultant decrease in incisor visibility. However, in the TAD group, in addition to intrusion, the incisors also proclined by 0.67 mm, but in CIA group, incisors retracted by 0.33 mm. There were nonsignificant mesial drift and significant extrusive movement of the maxillary first molars in the CIA group. The rate and amount of intrusion was greater in the TAD group. Conclusions: Both TADs and CIA can be effectively used for incisor intrusion which was, however, faster and greater in TAD group. Both the methods bring about associated unwanted tooth movements as well. Deep bite is defined as an increased vertical overlap between the upper and lower incisors. Deep bite correction is an important step in the orthodontic therapy due to its potential deleterious effects on the temporomandibular joint, dentition, periodontium, and esthetics. The nonsurgical methods of deep bite correction continue to be the same over years and involve either or combination of (1) leveling of the arch through eruption of premolars, associated with a clockwise rotation of the mandible, which serves to increase lower facial height, (2) intrusion of lower and/or upper incisors, (3) labial inclination of the incisors, and (4) molar extrusion. The choice of mechanics for bite opening depends on various factors. In nongrowing patients with deep bite who have a convex profile and increased maxillary incisor visibility, with normal or increased vertical dimension, the intrusion of maxillary incisors is the treatment of choice. Extrusion of posteriors in such cases will worsen the facial convexity, steepen the occlusal plane, and will increase the lower anterior facial height. Further, this method is both difficult and less stable as the extruded posterior teeth would impinge on the freeway space of and will be opposed by strong muscles of mastication. Various methods have been advocated for incisor intrusion, namely, reverse curve of Spee, intrusion arches such as Rickett's utility arch, Burstone arch, three-piece intrusion arch, K-SIR, Connecticut intrusion arch (CIA), vertical loops, J-headgear, mini-implants, etc. The use of segmented arches has made the force system more predictable and lighter to minimize root resorption but is still dependent on additional means to control anchorage. The recent popularization of temporary anchorage devices (TADs) has helped in overcoming this limitation of uncontrolled movement of posterior segment. Of the various arches used for intrusion, the CIA  has the advantage of being prefabricated and precalibrated and delivers light and continuous force under large activation. On the other hand, miniscrews for intrusion eliminate the negative effects on the posterior segment. Hence, the present study was undertaken to compare the efficacy of the CIA and miniscrews in intrusion of maxillary incisors for deep bite correction. This prospective study was conducted on 24 patients in the age group of 15–25 years undergoing fixed orthodontic treatment in our department. The sample size calculation was done based on the previous studies with power of the study at 80%. The ethical clearance was obtained from the research ethical committee of the institution. The inclusion criteria for the study were a deep bite of at least 4 mm, maxillary incisor display of more than 3 mm with no evidence/history of trauma or loss of the anterior teeth, and an average growth pattern (GoGn-SN 32° ± 6°). Group II - CIA group. A written informed consent was taken from all the individuals participating in the study. In both Groups I and II, fixed orthodontic appliances were placed (0.022” MBT), and after initial leveling and aligning, the maxillary arch was divided into three segments. The anterior segment comprised of the four incisors and the two posterior segments were from canine to first molar. Sectioned 0.019” × 0.025” SS wire were used as buccal stabilizing wires for the posterior segments and also to make four incisors to be intruded as a unit. In Group I, comprising of 12 samples, two self-drilling mini-implants (Absoanchor ® Dentos, Daegu, Korea), 1.3 mm in diameter and 8 mm in length, were placed between the roots of maxillary lateral incisor and canine on both the right and left sides under local anesthesia [Figure 1]a. The exact site of placement of implant was decided and checked by the use of an intraoral periapical radiograph. One week after insertion, the implants were loaded with superelastic nickel–titanium (NiTi) closed coil springs (6 mm in length) and an intrusion force of 30 g was applied on each side. To prevent any flaring of the anterior segment and to make the line of force pass through the center of resistance of the anterior segment, a passive distal tie was given to the anterior segmental wire. The patients were recalled every 4 weeks, and the screws were checked for signs of mobility or infection. At every appointment, the incisor display at rest was measured clinically, and the NiTi coil springs were reactivated if required, till desired amount of intrusion was achieved [Figure 1]b. In Group II, comprising of 12 samples, the intrusion of the incisors was done by the 0.017” × 0.025” Ni–Ti CIA ® (Ortho Organizers). 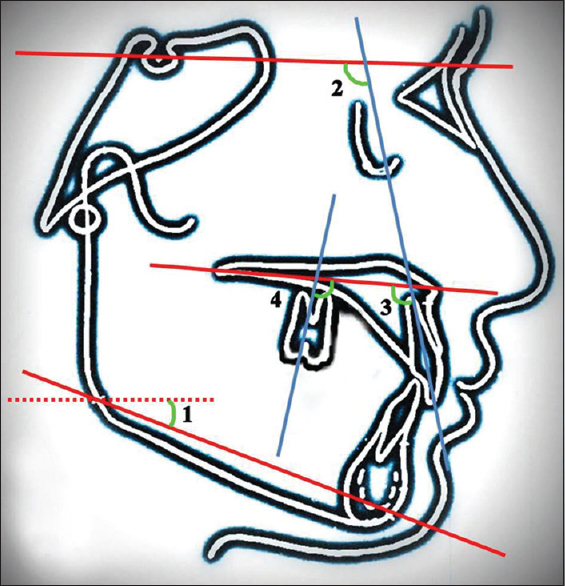 A transpalatal lingual arch made of 0.036” SS wire was used to reinforce posterior anchorage [Figure 2]a. The CIA is prefabricated with NiTi having appropriate bends necessary for easy insertion and use. 0.017” × 0.025” maxillary wire with anterior dimension of 34 mm was used. Posteriorly, the wire was inserted into the auxiliary slot of the first molar tube and anteriorly ligated distal to the lateral incisors, above the brackets. The distal end of the wire was cinched back tightly to prevent any increase in the arch length. The patients were recalled every 4 weeks for follow-up [Figure 2]b.
Maxillary incisor root centroid-U1Cr - this is the geometric center of the root taken as a point located at one-third of the distance of the root length apical to the alveolar crest. Once identified and located on T1 tracing, it was then transferred from T1 to T2 tracings by registration on the incisal edge and the labial surface. The vertical plane (true vertical [TV]) was constructed perpendicular at sella to the SN plane. The mean and standard deviation of linear and angular measurements in the pre- and post-intrusion lateral cephalograms of the patients was calculated for the TAD and the CIA group. The data were checked for normal distribution using the Shapiro–Wilks test. According to the results of this test, a paired t-test or a Wilcoxon signed-rank test was performed for the assessment of treatment changes within the groups, and an independent t-test or a Mann–Whitney U-test was used for the evaluation of changes between the groups. P < 0.05 was considered as significant. All statistical analyses were performed using the SPSS version 17 software (SPSS Inc., Chicago, IL). The effects of maxillary incisor intrusion with TADs (Group I) and CIA (Group II) were evaluated on 12 patients in each group. The mean age of the patients was 17.75 ± 3.49 years for Group I and 18.75 ± 3.47 years for Group II. The incisor visibility was 6.17 ± 1.30 mm and 5.46 ± 0.99 mm for Group I and Group II, respectively. The mean overbite of Group I sample was 4.42 ± 1.08 mm, and of Group II sample, it was 4.25 ± 1.36 mm. All the patients had an average growth pattern represented by GoGn-SN values of 31.08° ± 7.06° for Group I and 32.33° ± 4.68° for Group II [Table 1]. The mean reduction in the incisor visibility and overbite, postintrusion, was statistically significant [Table 2]. The amount of true incisor intrusion determined as Cr-PP distance was significant statistically for Group I, being 2.46 ± 1.21 mm (P< 0.01). 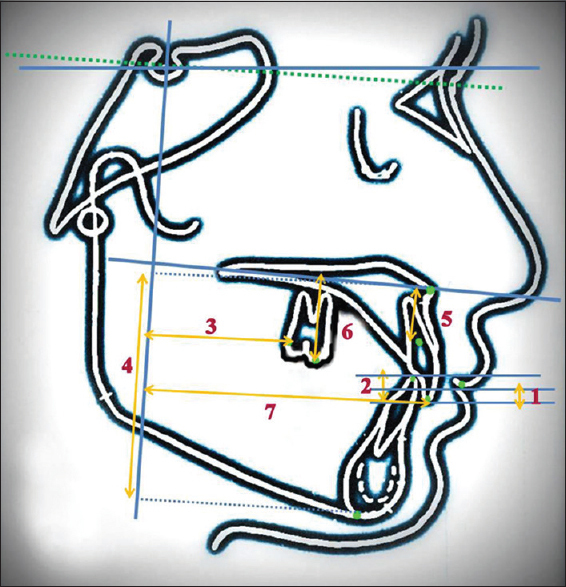 All other linear parameters, namely, lower anterior facial height (ANS-Me), change in sagittal position of the maxillary incisor (1-TV) and the maxillary first molar with respect to the TV plane (6-TV), and also the vertical position of the maxillary first molar with respect to the palatal plane (6-PP) were statistically insignificant for Group I. The maxillary incisor inclination changed significantly in Group I relative to both the SN plane and the PP. There was no significant change in the maxillary first molar inclination and the mandibular plane angle. There was a statistically significant change in incisor visibility and overbite in Group II postintrusion [Table 3]. The maxillary incisors intruded statistically significantly by 1.75 ± 0.72 mm (P< 0.01). Furthermore, the maxillary first molar extruded with respect to the PP (6-PP) significantly by 0.33 ± 0.49 mm (P< 0.05). Rest all the linear parameters, namely, lower anterior facial height (ANS-Me), change in sagittal position of the maxillary incisor (1-TV), and the maxillary first molar with respect to the TV plane (6-TV) were statistically insignificant. In Group II the change in maxillary incisor inclination relative to SN plane and PP was not significant. However, the axial inclination of the maxillary first molar relative to the PP changed significantly by 2.25° ± 2.99° (P< 0.05). The mandibular plane angle GoGn-SN did not show any significant change with treatment in Group II. The incisor visibility and overbite changed significantly in both the groups (P< 0.01), but intergroup comparison revealed a nonsignificant difference between the two groups (P > 0.05). The true incisor intrusion achieved in both the groups again was found to be significant for the individual groups (P< 0.01) but insignificantly different comparing the two groups (P > 0.05). The mean differences between the two groups in other linear parameters, namely, lower anterior facial height (ANS-Me), change in sagittal position of the maxillary incisor (1-TV) and the maxillary first molar with respect to the TV plane (6-TV), and also the vertical position of the maxillary first molar with respect to the PP (6-PP) were also statistically insignificant (P > 0.05) [Table 4]. The change in maxillary incisor inclination between Group I and Group II did not show any significant statistical difference (P > 0.05). The axial inclination of the maxillary first molar relative to the PP changed significantly for Group II, but between the two groups, there was no difference statistically (P > 0.05). The difference between the two groups was not statistically significant for the mandibular plane angle (GoGn-SN) (P > 0.05). Maxillary incisor intrusion lasted 4.6 ± 2.3 months in Group I and 5.8 ± 2.9 months in Group II, and the mean rates of intrusion were 0.53 mm/month and 0.30 mm/month for Group I and Group II, respectively. Deep bite correction by intrusion is the treatment of choice in patients with excessive incisal display, gummy smile, and vertical facial pattern. In such cases, the efficacious bite-opening method is the one which brings about desired true intrusion of the anteriors with minimal side effects of change in axial inclination of anteriors and/or posteriors, extrusion of posteriors, and root resorption of the teeth being intruded. The CIA is prefabricated which reduces chair time and thus is an advantage for both the patient and the clinician. Furthermore, it is claimed to remain active at a constant force level for a long period of time allowing long intervals between appointments and nearly eliminating the need for adjustments. Creekmore and Eklund were probably the first to report intrusion of maxillary incisors using mini-implant anchorage which have now increasingly being used in orthodontics to preserve anchorage. Thus, this study was undertaken to assess the efficacy of these two methods of intrusion. In this study, the maxillary incisors were intruded by 2.46 mm with TADs and 1.75 mm with CIA. This was the true intrusion achieved as measured from CR of the maxillary central incisor to the PP. Although the amount of intrusion in each group was statistically significant, the difference between the two groups was not statistically significant. In the previous studies on miniscrews, Polat-Ozsoy et al. have reported 2 mm incisor intrusion  while Raj et al. have reported 4.4 mm of true incisor intrusion. The amount of intrusion achieved using conventional mechanics, such as Burstone intrusion arch or Ricketts utility arches, has been reported to be ranging from 0.7 to 3.5 mm., CIA has been reported to be comparable to utility intrusion arch as there was no difference in dental and soft tissue effects of both arches. In a study comparing CIA and Burstone intrusion arch, CIA is reported to be superior in bringing about intrusion. The maxillary central incisor edge protruded by 0.67 mm in the Group I (implant group), while in the Group II (CIA group), the incisor retracted by 0.33 mm, as measured from the TV reference plane. The retraction seen in the CIA group was due to cinching back of the ends of the intrusion wire that prevented any increase in arch length. Polat-Ozsoy et al. have reported greater proclination of the incisors on intrusion with implants by 2 mm, which was because of the absence of distalizing or restraining force to the anterior segment as given in this study. The other studies with intrusion arches such as Burstone , and Ricketts utility arch  have reported greater proclination of incisors being 7° and 13.5°, respectively. Although the change in inclination of incisors was statistically significant for the TAD group, the intergroup difference was nonsignificant. The position and inclination of the maxillary first molar did not change significantly in Group I (implant group), as no anchorage was taken from the molars, while in the Group II (CIA group), there was slight mesial movement of the root as well as extrusion seen. This can be attributed to the mesial thrust on the molars created by cinching back of the intrusion arch and tip-back moment created on it. Significant amount of true incisor intrusion with the resultant decrease in incisor visibility was seen with the TADs as well as Connecticut Intrusion Arches, though the difference between the groups was not significant. The incisors proclined significantly in the TAD group, but the difference between the two groups was not significant. TADs resulted in 0.67 mm of incisor protrusion, while Connecticut Intrusion Arch retracted the incisors by 0.33 mm, though this difference was not significant. There was non-significant mesial drift and significant extrusive movement of the Maxillary first molars in the Connecticut Intrusion Arch group, but implant group did not show any such change. The difference between the groups was insignificant. Overall, both the techniques gave acceptable treatment effects. The results reflected that with the Connecticut Intrusion Arches there definitely was an effect on the anchorage unit, which is undesirable. Hence TADs are the preferred method for achieving bite opening, as the treatment duration is less while the amount of intrusion achieved is more. Huang GJ, Bates SB, Ehlert AA, Whitin DP, Chen SS, Bollen AM. Stability of deep-bite correction: A systematic review. J World Fed Orthod 2012;1:e89-e86. Sonnesen L, Svensson P. Temporomandibular disorders and psychological status in adult patients with a deep bite. Eur J Orthod 2008;30:621-9. Alexander TA, Gibbs CH, Thompson WJ. 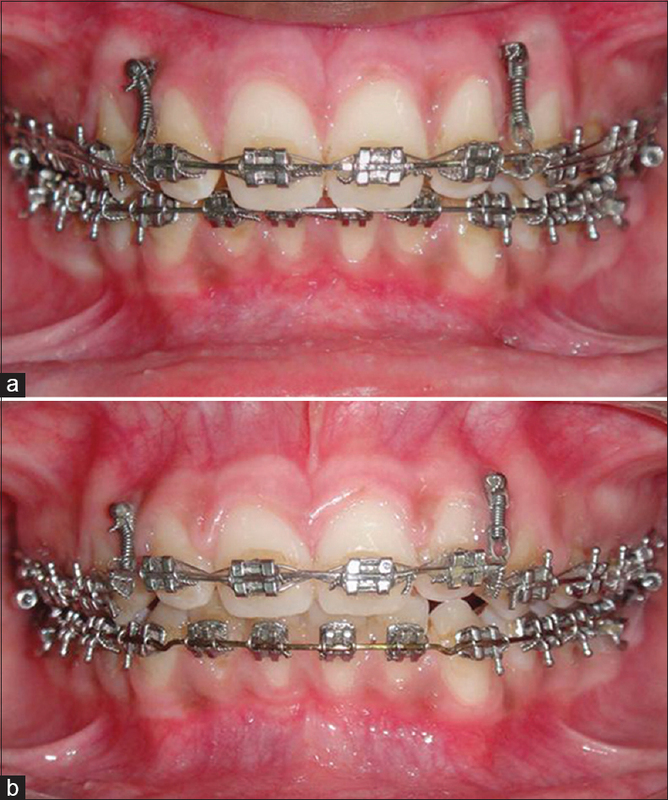 Investigation of chewing patterns in deep-bite malocclusions before and after orthodontic treatment. Am J Orthod 1984;85:21-7. Lindauer SJ, Lewis SM, Shroff B. Overbite correction and smile aesthetics. Semin Orthod 2005;11:62-6. Engel G, Cornforth G, Damerell JM, Gordon J, Levy P, McAlpine J, et al. Treatment of deep-bite cases. Am J Orthod 1980;77:1-13. Wylie WL. Overbite and vertical facial dimensions in terms of muscle balance. Angle Orthod 1994;14:13-7. Goel P, Tandon R, Agrawal KK. A comparative study of different intrusion methods and their effect on maxillary incisors. J Oral Biol Craniofac Res 2014;4:186-91. Upadhyay M, Nagaraj K, Yadav S, Saxena R. Mini-implants for en masse intrusion of maxillary anterior teeth in a severe class II division 2 malocclusion. J Orthod 2008;35:79-89. Nanda R, Marzban R, Kuhlberg A. The Connecticut intrusion arch. J Clin Orthod 1998;32:708-15. Athanasiou AE. Anatomy, radiographic anatomy and cephalometric landmarks of craniofacial skeleton, soft tissue profile, dentition, pharynx and cervical vertebrae. Orthodontic Cephalometry. Ch. 2. London: Mosby International; 1997. p. 23-53. Burstone CJ. The biomechanics of tooth movement. In: Kraus BS, editor. Vistas in Orthodontics. Philadelphia; Lea & Febiger; 1962. p. 197-213. Amasyali M, Saudi D' Lmez H, Akin E. Intrusive effects of the Connecticut intrusion arch and the utility intrusion arch. Turk J Med Sci 2005;35:407-15. Polat-Ozsoy O, Arman-Ozcirpici A, Veziroglu F. Miniscrews for upper incisor intrusion. Eur J Orthod 2009;31:412-6. Raj A, Acharya SS, Mohanty P, Prabhakar R, Karthikeyan MK, Saravanan R, et al. Comparison of intrusive effects of mini screws and burstone intrusive arch: A radiographic study. J Res Adv Dent 2015;4:102-9. Weiland FJ, Bantleon HP, Droschl H. Evaluation of continuous arch and segmented arch leveling techniques in adult patients – a clinical study. Am J Orthod Dentofacial Orthop 1996;110:647-52. Sifakakis I, Pandis N, Makou M, Eliades T, Bourauel C. Forces and moments on posterior teeth generated by incisor intrusion biomechanics. Orthod Craniofac Res 2009;12:305-11. Sifakakis I, Pandis N, Makou M, Eliades T, Bourauel C. A comparative assessment of the forces and moments generated with various maxillary incisor intrusion biomechanics. Eur J Orthod 2010;32:159-64.